1. For Corn Salsa, rinse frozen corn in warm water for 1 minute and drain. Combine with bell pepper and salsa. Set aside. Shred lettuce mixture. 2. Assemble tacos by sprinkling 1/3 cup lettuce onto center of each tortilla. 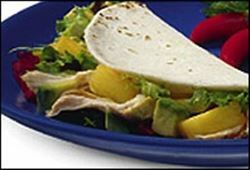 Sprinkle chicken, pineapple, avocado pieces and a tablespoon of corn salsa, dividing evenly. Fold tacos and place one on each serving plate. Enjoy this delicious Yucatan chicken tacos Mexican recipe!